Chums, one of the types of salmonid. The Salmonids are a race of fish creatures and the main antagonists and enemies of the Salmon Run mode in Splatoon 2. Their main ink color is dark green. All the Salmonids together in Splatoon 2. Lesser Salmonids. The two frontmost Chum have different frying pans. The Salmonids' hair looks like a Spartan Helmet. The Development of the various types of Lesser and Boss Salmonids depends on the environment where they grow. Boss Salmonids may be chosen because they are exceptionally large (Maws, Steelhead) or exceptionally smart and adept at using machines (Steel Eel, Scrapper). The Salmonids have a trade agreement with the Octarians, where the Salmonids provide Power Eggs used as energy sources in exchange for Octarian weapons and machinery. In the Splatoon 2 Ikasu Artbook, it is stated that Salmonid do not trade Golden Eggs, as they are too valuable. 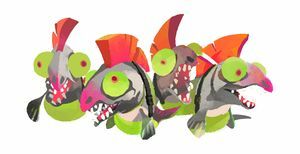 The Salmonids which use a frying pan as their weapon, consisting of the Chum, Cohock and Goldie, all have two variations of the frying pan. One variant of the frying pan has an emblem resembling a Salmonid, a metal handle, a smoother shape and circular rings on the pan. The other variant lacks these features, while having a wooden handle. Lesser Salmonids may make upward jumps of unlimited heights to splat players staying on walls for too long. The Salmonids' appearance resemble that of a salmon when they are in their spawning phase, which differs from ocean phase, where they turn more vibrant red and adopt brown and grey colors instead of the silvery color, they have a more elongated jaw that hooks downwards, bigger teeth, and some species also get hunched backs.